Hello Refashion Co-op! I'm Kristen and I am so excited to join you all as a new contributor here. I first got interested in refashioning a few years ago when I was looking at some of the awesome blogs out there. I started sewing and refashioning some things over a year ago and now am a technical apparel design student. I recently started my blog, Quirk Your Closet to share my refashions and other sewing and clothing related content. My most recent refashion involved transforming a t-shirt I had and a pair of thrift store jeans. 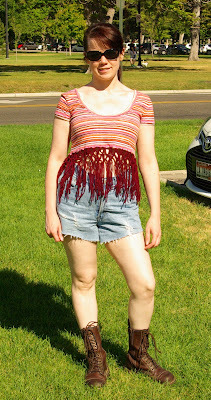 I wasn't a fan of the cut of this t-shirt neckline and where it was hitting at the bottom, so it was in for a dramatic festival style make-over, turning it into a fringed crop top. For the jeans, they were destined to become some distressed cutoff shorts. This was a lot of fun to take a sandpaper block to these jeans to get the distressed look. The jeans were a no sew refashion, making them a great project for anyone regardless of if they can sew or not. The final look is a festival ready style that is quite a change from where the outfit started. For a more in-depth look at how I did this refashion, you can check out the post about it on my blog. The shorts and crop will be much cooler at festival than before. Thanks for the link to your blog, I will check it out. I love what you did. I have been thinking that I need a pair of cut off jeans myself. The top turned out really cute. Welcome to the group.